Fred Meyer has just released their Black Friday ad. Fred Meyer is always one of the most popular places to head on Black Friday morning in the Northwest, due to their awesome sales they have every year and this year is no exception! Plus, this is the only store I know of that offers free coffee, juice & donuts for Black Friday shoppers! Love that you can get some sustenance for all your Black Friday shopping, with coffee for an extra boost of energy & juice & doughnuts to keep you fueled that morning. 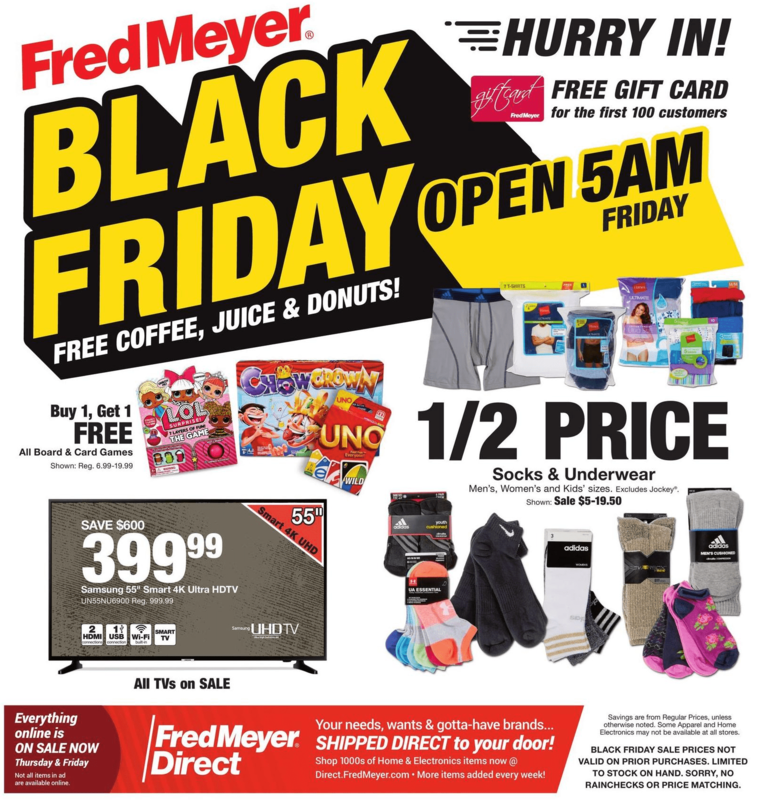 Black Friday Sale – Fred Meyer will be open at 5am Friday 11/23 for Black Friday sales. They will be offering FREE coffee & doughnuts. The Black Friday sale will run from 5am – 11pm on Friday 11/23. The items are limited to stock on hand. They do not offer rainchecks or price matching. Make sure to head to the Fred Meyer website to see all the Black Friday deals happening this year at Fred Meyer! It’s definitely a place you’ll want to put high on your list to shop! I can’t wait to take advantage of the Keurig deal! I am sharing this on Facebook! The buy 1 get 1 board and card games. The Xbox is my favorite deal! I shared! Our family loves board games, so the BOGO sale on them is always a favorite! Thanks for the giveaway! My oldest is due for a game system upgrade and the Xbox One looks like a great deal! I love the sock deal. Buy one get one board games is my fave deal! I always go for the socks! Great deal and selection! I shared this post with my wife! Required entry: favorite deal socks!!! Extra Entry: I shared this post through Pinterest! My favorite deal is Polaroid TV 55″ for $299 – awesome! The socks and houseware items! My daughter is moving into her first home at 23 and will need all kitchen appliances, tools, cooking, baking item! Sales r the best! I’ll be heading right to the scarves! Great price and makes a wonderful gift. Shared with my best friend! I think the buy one get one free on family games is my favorite! Socks!!! Every year I stick up on Black Friday! My favorite is the couch! Socks and board games!!! Yay!! I’m hoping to pick up one of the Polaroid 49″ 4K Ultra HDTV. I can’t wait for the sale, I prefer Fred Meyer to Walmart any day! Required entry: Socks, socks and more socks!!! I think I see a “S” pattern this year….sweaters, scarves & socks!!!! I shared this post with my Sis! 50% off Lego City Deep Sea Submarine my son has wants this so bad! I always stock up on the socks!! Gotta love that sick deal! I stock up every year!! The Closetmaid cure storage deal is GREAT!! The iPad Air looks very tempting! I need a new couch, great price in the ad. socks! always socks! coffee and donuts make the morning a little better too! Rubbermaid 24+4 piece Easy Find Food Storage Set is such a good deal!! 60% off coats! With my boy who is constantly growing, it’s great to save on a winter jacket for him! I love the deal on Bearpaw boots! Thanks for the giveaway! I love the throws as low as $2.99! I love giving throws as gifts and having extra around my house to!!!! My favorite deal is the buy one get one free board games and the xbox one deal for my kiddos! My favorite deal is the $15 gift card with Keurig purchase. Great scarves for me and a few others. We took advantage of the sock and board game deal! I bought socks, pajamas and a couple games! Love Fred Meyer on Black Friday! Got socks, gonna have to go back for boots! It was too hectic to try them on. Best deals- socks (best deal every year) and the games. Pjs for the family. They were a great deal. My favorite way I took advantage of Fred Meyer’s (favorite store by the way!!) Black Friday is their $20 boots!! Shared by word of mouth with my neighbor!